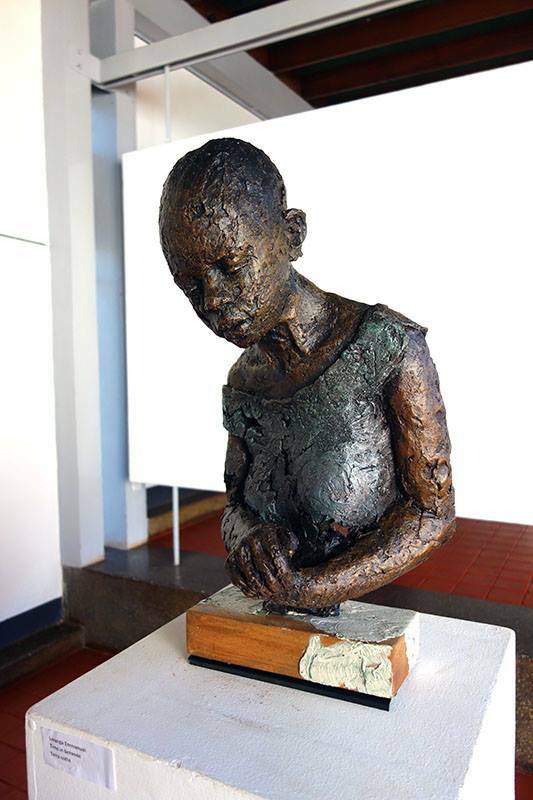 Beautiful Imperfections is the name of the sculpture exhibition showing at the Makerere art Gallery. It is a reflection of the paradoxical experiences of social life and the beauty that underlies the human figure. The three artists behind the exhibition namely; Bwabale Ivan, Lwanga Emmanuel and Mulondo Patrick are alumni of Margaret Trowell School of Fine arts, Makerere. 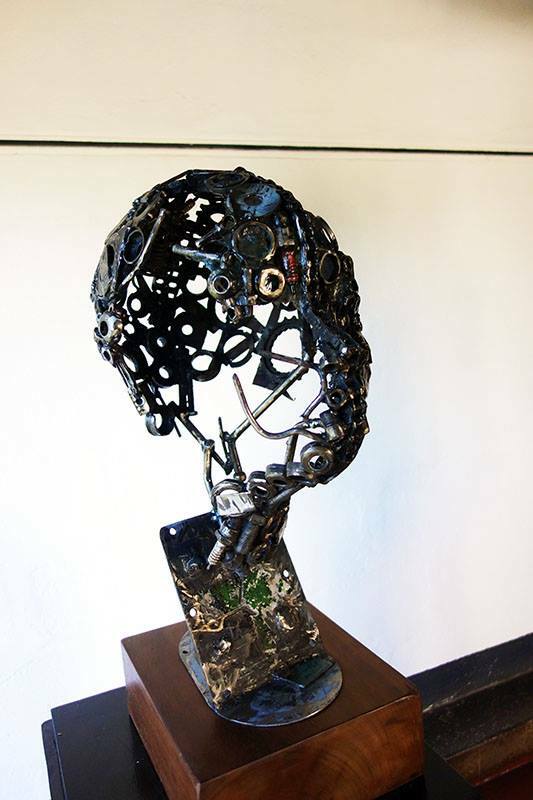 Their genre of experimental sculpture evokes working with found objects like metal scrap that includes aluminum plates, wires, bolts and terracotta (clay) that is synonymous with many contemporary sculptors. The art work features portraitures in form of the human figure, boda boda series and abstract figure compositions with metal configurations. The story and technique behind these art works provide a visual narrative that resonates with the public. 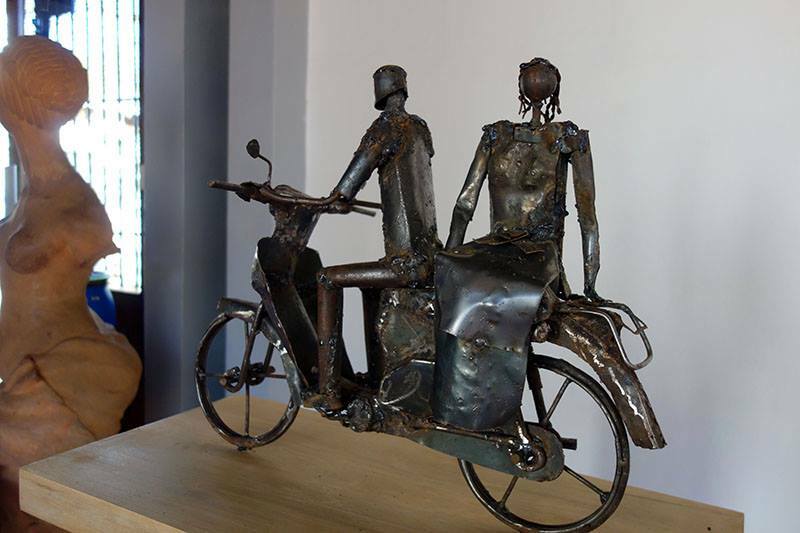 In the case of Bwabale Ivan’s boda boda series created from metal scrap the artist is able to open up debate about the benefits and dangers of these mobile taxis that ply the Kampala metropolis and its suburbs. The boda-bodas often described to as a quick remedy to the traffic jam in the city and the problem of unemployment by some politicians and city administrators, have in recent times become a medium of fatal accidents claiming thousands of lives of both pedestrians and passengers. Despite such tragedy, they continue to be used as a mode of transport and becoming an emblematic object of the city. Mulondo Patrick’s abstract human figures welded from metal scrap collected specifically from motor garages in his neighbourhood of Kawempe, allude to the problem of dumping and recycling that is much familiar with such communities. The artist in his community is regarded as some sort of mythical figure because of his ability to turn waste into cash. Albeit such “mysticism” he acts as an example to the youth in the community not to disregard any form of employment. More so, he represents success emanating from ideas that are least expected to be potentially viable. Besides the benefit of economic mobility and providing solutions to the problem of recycling and dumping synthetic materials, the sculptures will remind one of the legacy of traditional African art reflected in the use of synthetic objects to create functional objects. Francis Xavier Nnaggenda often considered as the father of experimental sculpture in Uganda (Dr. George Kyeyune’s text: Beautiful Imperfections: An exhibition of sculptures by Ivan Bwambale, Emmanuel Lwanga and Patrick Mulondo), left an indelible mark on sculpture at Makerere as he influenced sculptors like Dr. Rose Kirumira and Lilian Nabulime. Coincidentally, both lecturers taught these three artists, hence a reflection of innovation and sincerity in their work. The latter quality is much appreciated in the terracotta busts of Lwanga whose fragile images invoke the technique of sculptors like Gregory Maloba. Lwanga’s sculptures are described as “archetypal figures and expressions of feminine beauty” by Dr. George Kyeyune, sculptor and Director of the Makerere art Gallery. From a critical perspective, these busts created by the youthful artist bare resemblance to Kyeyune’s busts made from the same material. They will also bring to memory the subject of the human figure that has been consistently been explored by Dr. Rose Kirumira a protégé of Francis Naggenda. Working with the subject of the human figure gives the art work an attribute of African traditional art. Traditionally, artisans on the continent created human figures either from hardwood or clay as a symbol of spiritualism and festivity. The exhibit’s venue serves the purpose of bonding the alumni with the students and lecturers. The idea though not new-Henry Mzili Mujunga and Daudi Karungi both graduates of Margaret Trowell, have had an annual exhibition here, Daudi-Mzili: Dichotomy of Creativity– cements the relationship between former students of the institution and the undergraduates. Such initiative, inspires confidence among the latter group. They begin to understand that being an artist is productive. Showing art at this public gallery that is at the same time not commercial, provides an opportunity for critical appreciation of the art work. The displayed work is carefully selected by professional hands, curators, to invoke artistic dialogue that fosters innovation and creativity in the industry. Such hunger for success qualifies them as a new breed of perfectionist artist. However, it remains to be seen if this exhibition will become an annual event at Makerere like Dichotomy of creativity. If it does, it will be a source of inspiration for many other young artists to look beyond producing art for survival and create art for art’s sake.